You are almost there. You just have the resistors, capacitors and battery to install and you will be ready for the big switch on. Bend and push the resistor leads into the board as shown. Resistors do not have a polarity so you can put them in either way round but you must get the correct value resistors in the correct positions. You may want to trim the leads with wire cutters before placing in the board. This won't make it work any better but the circuit will end up looking neater. 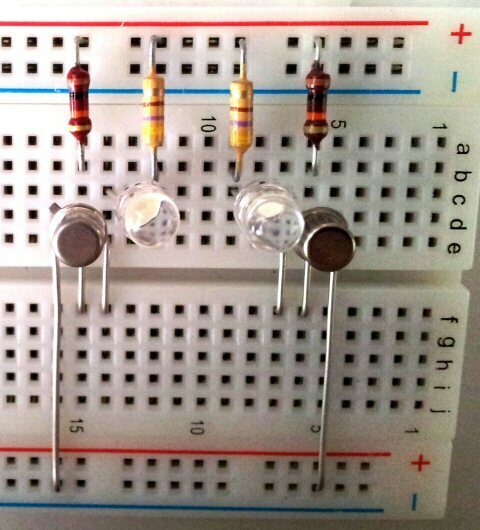 The two resistors in the middle are 470 Ohm and the two on the outside are 10k Ohm values. Bend and insert the capacitor leads as shown. 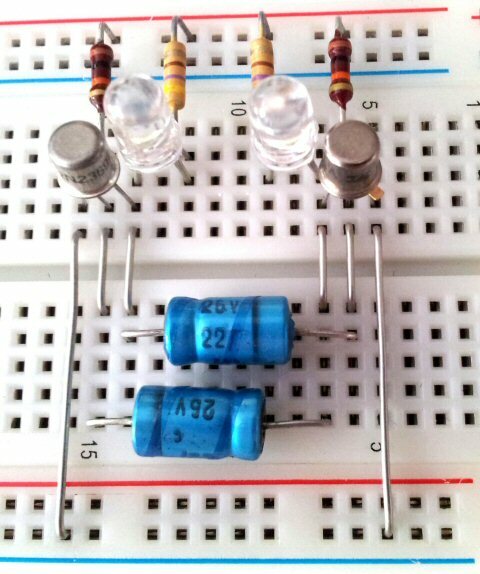 Your capacitors may look different to mine and you must make sure that you put them in the correct way. Electrolytic capacitors have a positive and a negative end. This is often shown with a '+' or '-' symbol close to the leads. If the capacitor has a lead at each end a black band may denote the negative end while a groove may be close to the positive end. Make sure you check before powering your circuit. I secured my 9 volt battery to the board with an elastic rubber band. You can do the same or find another method. Use a clip on battery connector and insert the leads in the power lines at the top and bottom of the board. Positive to the red row at the top and negative to the black row at the bottom. Attaching the power from the battery should make your circuit burst into life and start flashing. If it doesn't start flashing immediately then disconnect the battery immediately and check all of your connections. If you are certain that everything is connected correctly and it still doesn't work then start replacing components one by one until you find the faulty one. Start swapping components for new in this order - Battery - Battery connector - Transistors - LEDs - Capacitors - Resistors - Solderless breadboard. Don't give up until you find the problem in your circuit. There isn't much that can go wrong.